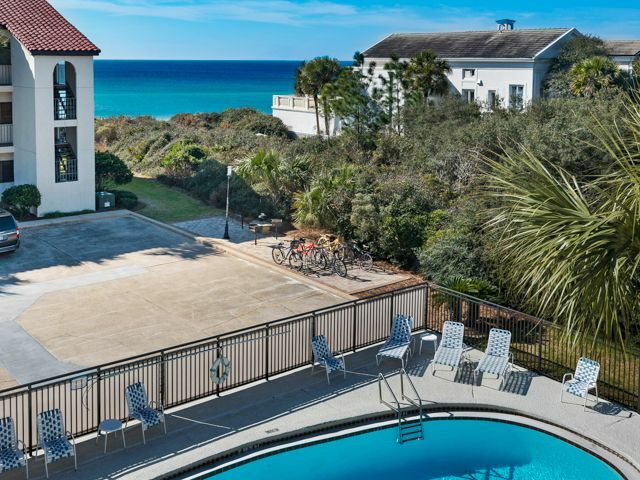 Your perfect vacation awaits you at the Palms of Seagrove! You'll enjoy strolling along the sugar white sands while enjoying your favorite tropical drink, or just relax poolside. Walk to shopping and fine dining from the Palms or take a bike ride along the bike path that meanders along 30-A. The Palms at Seagrove offers its guests large 1-bedroom, 2-bath condos that are perfect for your special family vacation. Sleeping up to 6 people, this third floor gulf side condo overlooks the pool with a nice view of the gulf and has a king bedroom, hall bunks for the kids and a queen sleeper sofa. This brightly decorated unit has a fully equipped kitchen and a stack washer/dryer. * Rentals are a 3 night minimum. * Sorry, no pets are allowed. Great Condo.. beautiful.. just beautiful..
Garrett property was amazing.. small hiccup and they were on it..
Property was in a great location! seriously close to everything, including the beach. Great area, super family friendly. Condo was clean and roomy. We had a great view from balcony also. The big complaint we had was that the bed was very uncomfortable. One may say that some of the finishes were a bit outdated but we weren't there for the look of the condo, we were there for the beach so didn't hugely bother us. We would recommend this property and would love to go back!